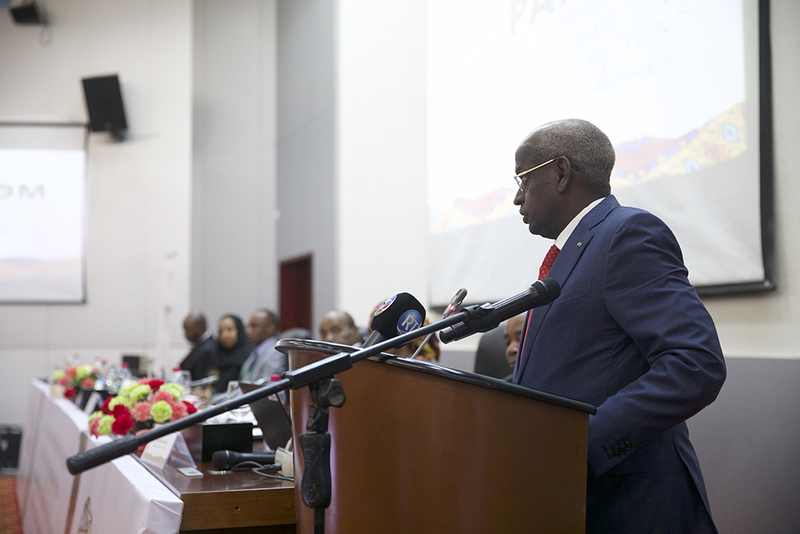 Djibouti City – The Fourth Pan African Forum on Migration (PAFoM IV) began yesterday (19/11) in Djibouti City under the theme, Harnessing the Benefits of Free Movement of Persons Regime for Sustainable Development in Africa. The Government of Djibouti is hosting the three-day conference in collaboration with the UN Migration Agency (IOM), the African Union Commission (AUC) and Intergovernmental Authority on Development (IGAD). Held annually since 2014, the Forum aims to provide more focused engagement with all relevant migration stakeholders on the African continent. Dozens of delegates are gathered representing 34 African Union member states, Regional Economic Commissions (RECs), international organizations, private sector, trade unions, academia, parliamentarians, African diaspora community and civil society organizations working on migration issues. The conference covers a myriad of topics related to migration in Africa, including: a coordinated human mobility agenda for Africa: the benefits and challenges of free movement; the continental free trade area; accurate data for evidence-based policy making; and fostering social cohesion, integration and security cooperation. The event complements efforts being made by the African Union (AU) and respective RECs to increase the capacity of member states as well as consolidate instruments, policies, laws and other commitments that facilitate the free movement of people, goods and services on the continent. A recent study commissioned by the AU and IOM revealed that more than 80 per cent of African migration today occurs within Africa itself, either intra-regionally (particularly within the West, East and Southern African regions) or inter-regionally (from West Africa to Southern Africa, from East/Horn of Africa to Southern Africa and from Central Africa to Southern Africa and West Africa). It is thus becoming increasingly important for the AU to guide renewed policies of free movement of persons on the continent. Free movement of African populations is one of the flagship projects of Agenda 2063, the blueprint to propel the continent to prosperity within the next 50 years, which emphasizes “a continent with seamless borders”. However, the Africa Visa Openness Index, a guide by the African Development Bank (AfDB), reveals that African countries remain largely closed off to African citizens. Consequently, in January this year, Heads of States and Government of the African Union adopted the Protocol on Free Movement of Persons, the Right of Residence and the Right of Establishment in Addis Ababa. The Protocol is one of the pillars of the integration process of the continent, along with the Agreement on the African Continental Free Trade Area and the Single African Air Transport Market. The Protocol includes an Implementation Roadmap in which people can move freely within the continent with clear pathways for regularizing their stay and businesses in countries of destination. It will also enhance collection of reliable data on such movements, promote portability of skills and social protection among labour migrants, hence ensuring their effective participation in building the economies of the host community. For more information: Lalini Veerassamy, IOM Djibouti, Tel: +216-2959 8604, Email: lveerassamy@iom.int. Or Eric Mazango, IOM Ethiopia Special Liaison Office, Tel: +251 904645879, Email: emazango@iom.int.